Utilizing one of my larger gaiwans and about a tablespoon of this tea, I rinsed the tea and got right down to the first infusion of 30 seconds. Smells a bit fruity, a bit sweet, yet mellow and slightly grassy at the same time. The liquor is very clear and bright. The taste is a bit darker and more woody than I expected from the smell. Also, I noted the taste to be a bit more watery than expected Perhaps more than 30 seconds are necessary for the second infusion. The 45 seconds I gave the second infusion brought about a darker hue, perhaps not as bright, yet still clear. It definitely improved the flavor. Over the next three or so infusions I put these leaves through, this tea never grew very strong, but sipping it truly was a delight. The aftertaste of this tea is stronger than expected, composed of floral and fruity notes. 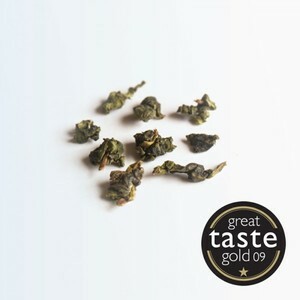 Overall, a thoroughly pleasant oolong that I would definitely recommend. On my personal scale, I give it an 85/100. This tea is sadly no longer available from Canton Tea Co's website.